THE SEASON OF COMPETITIONS 2018, ENDING WITH A VERY NICE VICTORY IN PARIS, CAN YOU TELL US ABOUT IT? 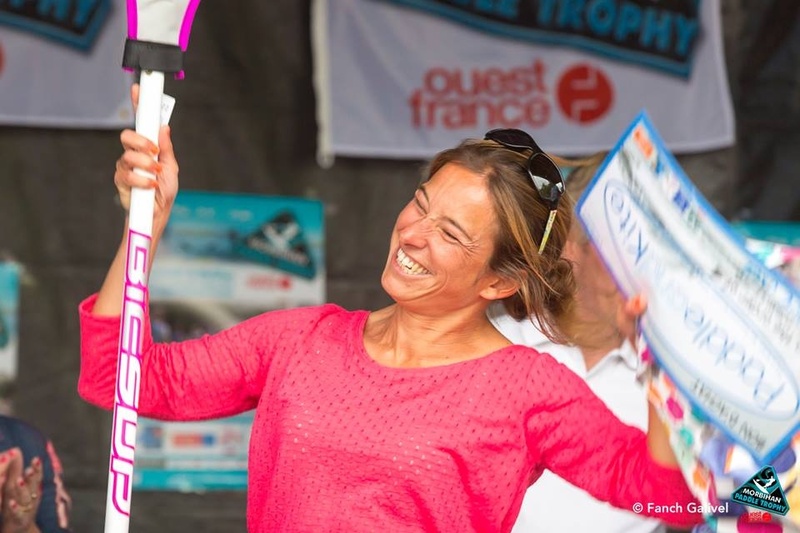 The 2018 season was quite a long one, it started at the GlaGla Race in January and ended in December at Paris Sup Crossing where I finished 1st and 9th in the General Women’s division! During this year, I participated in many races in Brittany, Poitou Charentes in Vendée and Haute Vienne. I also participated in several races of the French Cup 12 ‘6 “and 14 feet. My results were quite satisfactory because I climbed the podium several times. Last year and since 2016, I had the chance to paddle on the beautiful and powerful 3 Bay boards, using a new Broken Head 14 ‘x 22 “and my 12’ 6” Allwater and Flatwater. WHAT ARE YOUR 2018 PALMARES? THIS YEAR WAS ALSO YOUR FIRST USE OF A 14 ‘. SATISFIED OR DISAPPOINTED? Moving to a 14 ‘ was for me a “big” change. It is a board length that is less adapted to my size. At the beginning it seemed to me harder physically. However, I think that it allowed me to progress, particularly downwind. However, I keep a preference for the 12 ‘6 “because it is the board best suited to my size and I regret that it disappears from the Federal circuit FFS. WILL YOU RENEW YOUR BOARDS FOR THE NEXT SEASON? A new ARROW HEAD (Flatwater) of 14 ‘is already being manufactured at the 3 Bay workshop and we will soon replace my Broken Head 14’ with a slightly narrower one. HOW DO YOU ORGANIZE YOUR TRAINING AND YOUR PHYSICAL PREPARATION? I will have a little winter break that will give me the time to do something else: enjoy my friends, practice other sports in leisure mode and travel to Asia! Until last August my training was not really organized. 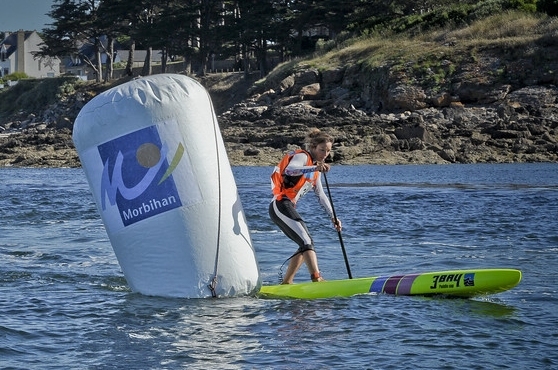 In Lorient, we are a small team of paddlers. The training is adapted depending on weather conditions and upcoming deadlines. At the end of the 2018 season, I had the chance to benefit from the advice of Eric Dèmouliere from Xpertise Coaching. His advice allowed me to better organize and plan my training and undoubtedly to have had better preparation for the last French Championships. 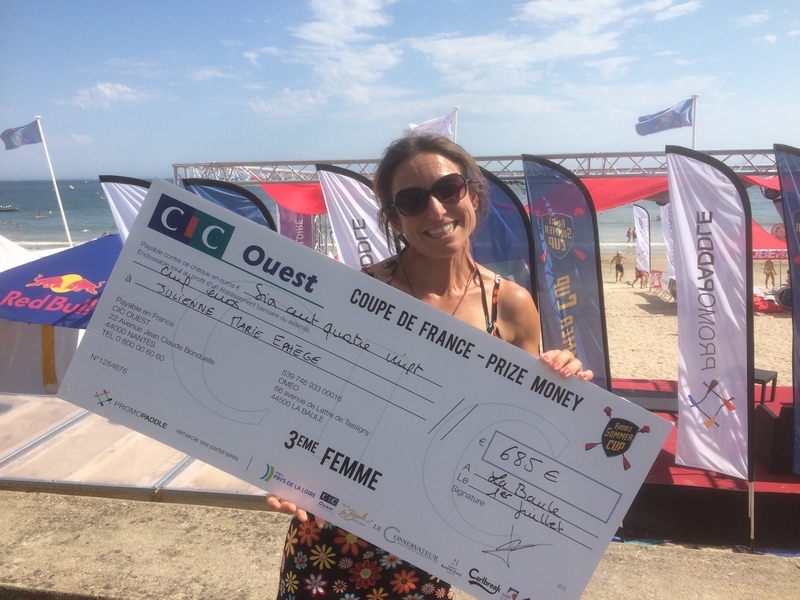 My name is Marie-Elphège Julienne, I live at Larmor-Plages, near Lorient in the Morbihan. I am a nurse in addictology. WHEN AND WHERE HAVE YOU STARTED SUP? 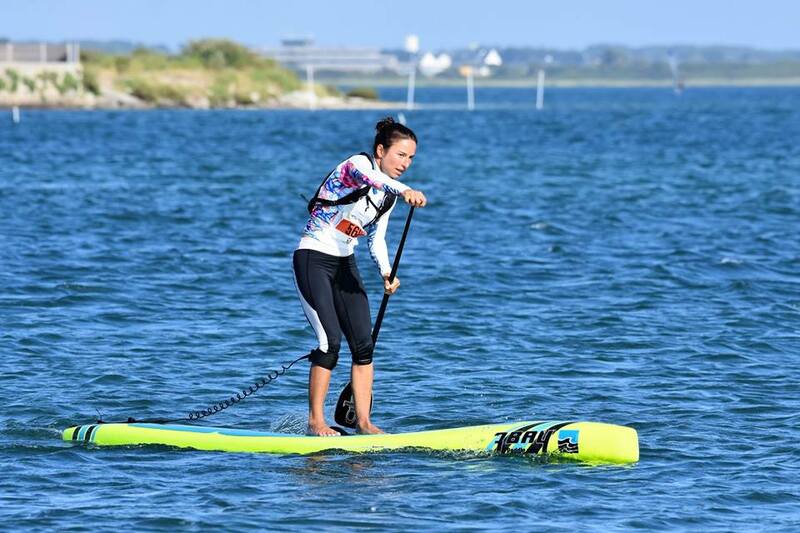 About 4 years ago, in Pornichet, I discovered SUP by coaching in sailing school. 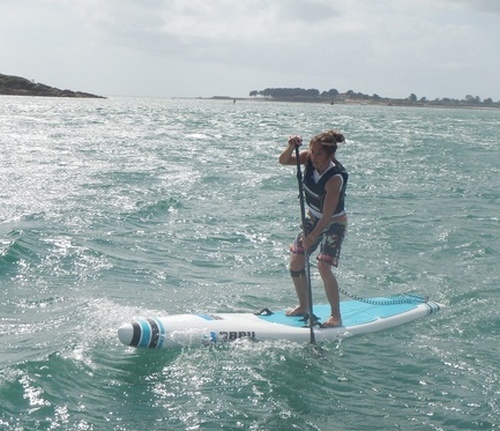 Then with the Association Nautik Experience, I participated and supervised some outings on the Gulf of Morbihan. In April 2015, back from a humanitarian mission, I was very motivated to start the competitions. I then invested in a board and left for new adventures. I’ve been sailing a lot, then kite and a bit of surfing. Today, I spend more time paddling and kitesurfing or surfing are more rare. SUP RACE, SUP SURF OR FLATWATER? 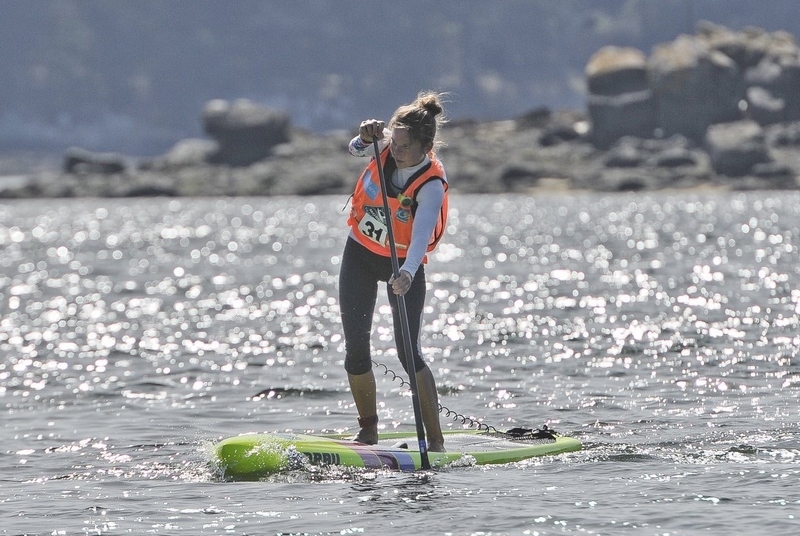 I like the SUP Race because it offers a wide variety of practice on the flat, downwind and beach race. For me joining the 3 Bay team is a great chance. The boards are tops, unique, they are personalized and adapted to everyone (even for small sizes, like me). Patrice is a very nice person. It’s nice to paddle on a board made locally. WHAT ARE YOUR 2016 PALMARES? In 2017, I will follow the calendar of the 12 ‘6 and 14’ federal competitions. And I also want to test myself over very long distances, starting with Dordogne Intégrale on May 27th.